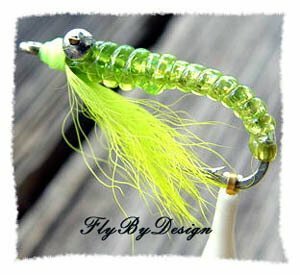 Crazy Charlie“Nasty Charlie”Chartreuse Fly Fishing FlyTwelveFlyColor:ChartreuseHook Size:8Classic bonefish fly & excellent general purpose freshwater flyBob Nauheim originally tied this fly to emulate glass minnows but soon realized that the bonefish were taking it as a shrimp. He designed it while fishing with a famous Bahamian fishing guide Charlie Smith. Instead of naming the fly after himself like so many other tiers he called it 'Bonefish Charlie Smith'. When it first took fish Charlie could not stop saying "Dat fly nasty!" because of the staring bead chain eyes. Thus was born the Nasty Charlie. When it started to be tied commercially, the marketers inadvertently changed the name from 'Nasty' to 'Crazy'. Since then the Crazy Charlie name stuck.The Crazy Charlie comes in a wide variety of colors and materials. It effectively emulates just about every species of shrimp and even some smaller crabs. By adopting the steelheaders' bead-chain weighting technique to both sink and jig the fly, this fly became the father of modern bonefish design.It was made to cruise at or near the bottom so it is easier to catch the elusive bottom feeders. This fly with its inverted hook pattern was designed so that the hook rides above the shank in the water. The idea was to keep the hook from snagging the bottom. By adding a relatively stiff wing material near the hook eye which flows back to cover the hook point, the fly becomes nearly weedless. The Crazy Charlie will bounce up and down on the retrieve and make puffy little clouds on the bottom which most likely will send out visible signals to nearby fish who interpret it as, “there is something moving down there that maybe good to eat.”With bonefish, the best fly is one that will hit the water with little impact, which makes the Crazy Charlie more effective than those that strike heavy and spook fish. The best way to fish this fly for bones is to strip the fly once or twice until the fish see it, let it drop, and watch the fish's movement and see if it there is a pick-up.The Crazy Charlie is a terrific fly for many species other then bone fish. In Southern California it is not uncommon to find the knowledgeable fisherman catching California Halibut, Yellowfin, Spotfin Croakers, Corbina and Surf Perch with Crazy Charlies and Clouser Minnows. Occasionally you can catch something bigger like guitar fish and Leopard Sharks. For a chance at big permit of 25 pounds or more, then go to the Florida Keys from the southern end of Biscayne Bay all the way down to Key West.The Crazy Charlie is yet to be fully discovered as a deadly freshwater fly but it was adapted with great success for Steelhead in the Great Lakes and later for west coast steelheading. This fly was also a great surprise how well it worked for me when fishing Gulf Coast Redfish this past year. Tip: Use a furled leader for optimum presentation and strike detection.Add flies & leaders to any order& we won't increaseyour shipping cost! * Free Priority Mail, Insuranceand no sales tax on all orders over $99 (USA only). Lowcost insured shipping anywhere in the rest of the world.Plus NO SALES TAX on your purchase!Free Shipping & Insurance*Lightning Fast ServiceTop Quality ProductsThe Best PricesNo Sales TaxFast Shipping!Are you in a hurry?Order Now & Fish Tomorrow!Next Day Delivery Available when you pay.STOP!READ THIS BEFORE YOU PAY FORYOURORDERWait for us to combine all orders into one invoiceand youwill save money and possibly get FREE shipping. Every invoice with shipping charges includes a $1 handling charge. The $1 handling charge is dropped on combined orders of $40 or more (USA). Do NOT make multiple payments as this increases our PayPalfees and your handling charges.Disregard allthe eCRATER automated requests for paymenton individual orders. International Buyers – Please Note: Import duties, taxes, and charges are not included in the item price or shipping cost.These charges are the buyer's responsibility.Please check with your country's customs office to determine what these additional costs will be prior to looking or buying. *Posted per eCRATER "Rules & Policies" guide lines.MORE GREAT DEALSFEEL FREE TO buy ON ANY OF OUR productS OR VISIT OUR eCRATER STORE! VISIT OUR eCRATER STORE!Wesell new high quality flies at wholesale prices.Check out our store. Many items are not listed, so give us a call if you don't see it!Be sure to add me to your favorites list!Fishing WadersWading BootsFly Fishing Flies Fly Fishing Reels Furled Leaders Knot Tying Tools Bobbers Lures Fishing Line Books, CD’s & DVD’s Marine Products + Much More! TestimonialsFlies arrived today, thank you very much for your speedy delivery . The best customer service of any eCRATER purchase I've had in 5 years. Will spread the word, thanks again.. John Williams very professional, trustable eCRATER seller, would buy from him again. Bob These leaders are the BEST and I can HIGHLY RECOMMEND - Thank U - AAAA++++ Excellent seller. Package arrived timely and well packed. 10-out of 10.!! Great Seller. Never have been disapointed. Morton Awesome eCRATERer, great prouct , Perfect !!!!!!!!!!!!!!!!!!!!!!!!!!!!!!!!!!!!!!! Mark H Ties the neatest 'Barrel' knot I have seen, thank you (E Z Knot Tying Tool for Fishing) Greatest flies on earth. jbc131 Quality product coupled with great customer service and prompt shipping.5lakota23 husband v. impressed with these, highly recommend Surprising improvement over tapered braided or any other leader I've used in 50 years. catdoctorx best furled leader i have ever bought. Others don't compare. Maclover95 The Absolute Best Leaders on the Market, Thank You!!! finsandfeather YOUR SATISFACTION IS OUR GUARANTEE!Payment should be settled within 10 days of product close, but can be extended to 30 days if you are accumulating additional items from our store, web siteand/or products. We will combine all your ordersso you can pay one invoice and get reduced or free shipping. * Inexpensive International shipping to customers outside the United States; please contact us prior to looking for a shipping cost if not listed or another method of shipping is desired.FREE shipping to destinations within the USA on combined orders of flies and furled leaders of $40 or more from our store and our products. *Free Priority mail Shipping, Insuranceand no sales tax onUSA orders over $99.Additional Shipping Information Please note: For your protection andat no additional cost to you, all ordersover $200 are shipped Insured with Signature Confirmation.Shipping isCalculated by the United States Postal Service & UPS**UPS, Priority Mail & Express Mail are available options onmost ordersUSPS Delivery Confirmation included with most domestic ordersAll items will be expertly packed All paid orders are shipped within 24 hours (excluding weekends & holidays) Positive feedback is posted upon successful receipt of payment. No Reserve products Always a low starting buy Established web company No Sales Tax Toll Free Phone Number (800) 395-6161Weanswerall e-mail messages within 24 hoursOpen door return policy -In the unlikely eventyou are unhappy with your purchase. All returns must include a return authorization number. Return unused product with the Return Authorization number that we will give you, in the original packaging, within 30 days and we willimmediately replace or refund your purchase price. Your purchase is backed by our 100% Guarantee of Satisfaction. We will provide a full refund (minus shipping), if your item is returned to us within 30 days after your receipt and is in "as new" condition. Shipping charges will also be deducted from refund on items shipped to you with free shipping. A reasonable deduction will be made for any damaged or missing items. Be sure to insure and pack your return carefully.Please call us at 800-395-6161 to let us know your package is being returned.We have THOUSANDS of Positive Feed Backs! Check it out - customers love our products and service and you will too! Once you place an order, eCRATER will automatically send you an invoice. Ignore these messages if you are still shopping.I will combine individual orders into one invoice at least once a day, so don't respond to an invoice request until you are ready to pay. If possible, make only one PayPal payment as multiple payments will increase our processing fees with PayPal andpossibly your cost.Please pay for your items within 30 days from the date of your first order. FREE or low cost shipping on all combined orders (based on total weight). There are NO additional shipping charges if you add fliesor furled leaders to anyU.S. order. Enjoy FREE Insuranceand Priority mail or Federal Express shipping within the USA onall combined orders over $99.Please advise if you would prefer to use a major credit cardinstead of PayPal. YOUR PRIVACY IS GUARANTEED!I HATE SPAM AS MUCH AS YOU DO.We accept most major credit cards through our secure onlineweb siteor youcan use PayPal.